More details have emerged about the PSNI's failure to disclose all of its files on the Sean Graham Bookmakers' killings to the Police Ombudsman. Five people were killed by loyalist paramilitaries in the 1992 gun attack. The BBC has seen a PSNI report that was sent to the Policing Board last week. It suggests the Police Ombudsman knew in September 2018 that some files had not been handed over, but waited almost six months before making a public announcement. The report was submitted by PSNI Chief Constable George Hamilton, at the request of the Policing Board, which asked for a written explanation. Mr Hamilton has insisted that information about the killings was not deliberately withheld. He blamed the PSNI's record-keeping system, which he admitted needs to be improved. "It appears the researchers focussed their checks on paper files and believing those to be comprehensive, did not check the legacy computer files that they would sometimes examine as part of their searches," he said. "This was compounded by the fact that the researchers appeared to be unaware of another legacy computer system which, if they had checked, would have revealed another small number of relevant documents." September 2018 - Ombudsman asks PSNI why they had not seen some of these files before. The Ombudsman has subsequently confirmed it became aware in September 2018 that police may not have disclosed all relevant information. A spokesperson said the watchdog established this was definitely the case at the end of the year. In the report, the chief constable insisted: "The PSNI never sought to deliberately withhold this information." At the same time, he said the police needed help to deal with legacy cases. He added: "The PSNI is not resourced to deal with the past." The police said they have more than 44m pieces of paper and microfilm, plus millions more computer-based records "that exist on multiple computer systems". The report revealed: "The material is not stored in one place. It is held on computer systems, on paper and in mircroform at a number of locations within the police estate. "There is no central reference or inventory for every piece of information gathered over many decades." The report added: "Some legacy material can only be found on unstable and archaic systems which lack the advanced search facilities of modern computers." A Police Ombudsman spokesperson said: "We knew in September 2018 that police may not have disclosed all information relevant to the Sean Graham attack, but it was not until the end of the year that we had established this to be the case, and the extent of the problem. "In the meantime, a team of investigators had conducted a line-by-line assessment of the material which had come to light. This took several months, and it was only then that we had the information required to advise families about the impact on their individual cases. "They were then briefed and also advised about the steps we had taken, and having done that we then issued a public statement to advise the wider public about the issue." 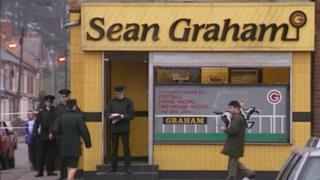 Five Catholics were killed in the Ulster Freedom Fighters (UFF) gun attack on Sean Graham Bookmakers' in south Belfast in February 1992. The Police Ombudsman, which is the PSNI's oversight body, is carrying out an investigation into the police's handling of the case. Some of the relatives of the people who died have been involved in a civil action. It was only when files were released last year as part of the civil proceedings that the Police Ombudsman, Dr Michael Maguire, realised that more files should have been shared with him. The Department of Justice has ordered an independent review into what went wrong. The chief constable and senior officers are due to meet the Policing Board on Tuesday morning to discuss the matter.